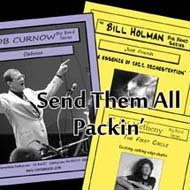 Festival 3-Chart Program - "Send Them All Packin'"
This festival program will send the competition running for the hills. These diverse, well-laid group of arrangements will absolutely stun your audiences. While it will certainly be a challenge for your band, in the end it will be extremely rewarding and well worth it. The musical journey that you and your band embark on with this music will undoubtedly be met with thunderous applause along the way!